 Click here for a preview and work in progress pictures.  2014 USBBY Outstanding International Book honor list. 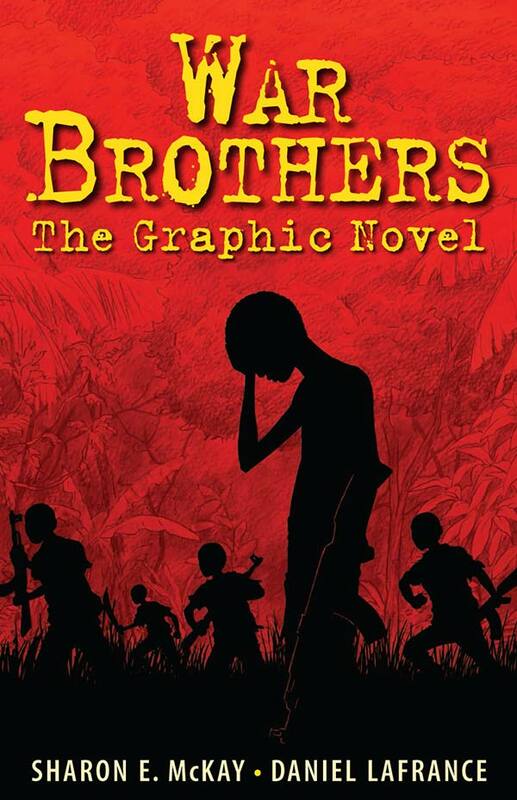  War Brothers: The Graphic Novel have both been selected for YALSA’s list of Popular Paperbacks for Young Adults 2014.  War Brothers: The Graphic Novel has been selected for YALSA’s Quick Picks for Reluctant Readers list.  War Brothers: The Graphic Novel; Young Adult Library Services Association's (YALSA) 2014 Great Graphic Novels for Teens List; also recognized as one of the Top Ten titles on the list.  War Brothers: The Graphic Novel has been nominated for a Stellar Book Award: B.C.’s Young Readers’ Choice Award. The unforgettable story of a child soldier. When fourteen-year-old Jacob is brutally abducted and forced to become a child soldier, he struggles to hold on to his sanity and the will to escape. Daniel Lafrance’s striking artwork and the poignant, powerful text capture the very essence of life as a child soldier. Readers will never forget the experiences of this young boy struggling to survive, unsure who to trust, afraid of succumbing to madness, and above all, desperate to get to freedom. In the end, Jacob engineers a daring escape. This graphic novel is based on the acclaimed novel of the same title, winner of a 2009 Arthur Ellis award. The author spent time in Uganda and based this story on real-life accounts of the horrors inflicted on child soldiers and their victims. This is a story of unthinkable violence, but also one of hope, courage, friendship, and family. A truly important work that is well worth the read. ... one of the most powerful graphic novels of 2013. … a great resource to have in any library collection. It is essential that … teens be aware of what goes on in the world. That it is in graphic novel form makes the story more accessible to youth. As upsetting as this story is—all the more for its basis in the ongoing reality for children still conscripted into the LRA—McKay doesn’t leave readers without a sense of hope. ...a gritty read, graphic in its story premise, in its details, in its reality. ... contains a powerful message about the redemptive power of hope and the resilience of individuals. The book had clearly moved him [the author’s son], and he was ready to begin thinking about what violence can mean to real-life people -- including children. War Brothers is based on McKay’s exhaustive research and extensive interviews with former child soldiers, and the verisimilitude she brings to her characterization and storytelling renders the abstract concept of child soldiers with an all-too-real clarity. Lafrance’s art adds another layer, transitioning from crisp naturalism to stylized shadows and colours as panic and violence rise in the characters. The art is never over the top, however; it withdraws from moments of bloodshed, turning away much as the reader wants to. ...an unforgettable glimpse into child soldiers’ vivid and painful experiences. The youth of the world have the responsibility and the power to be engaged to alter the future of humanity. War Brothers is a means to convey the plight of child soldiers in Northern Uganda to young people through a lens that is accessible and attention grabbing. Young people should be outraged that their peers are being systematically abused by adults in wars that ultimately benefit no one. ...tells in vivid and harrowing detail the story of children abducted to become soldiers in the Lord’s Resistance Army in Uganda. While capturing the horrific tragedy of the life of child soldiers, co-creators Sharon E. McKay and Daniel Lafrance also manage to offer inspiration: war decimates, and yet everlasting bonds can also be forged. This is a sorrowful and all-too-true story, but one that ends on a hopeful note. It’s done with such a delicate finesse that it offers a path to empathy without causing a kid to sink into depression about the implications and possibilities. This story has haunted me for weeks. In this devastatingly realistic graphic novel, 14-year-old Jacob and his friends are just starting school at George Jones Seminary for Boys. The story tells of their subsequent kidnapping and near induction into the Lord’s Resistance Army (LRA). Complete innocents at first, the boys endure near starvation, grueling conditions, and physical violence as they travel out of northern Uganda and into Sudan. Many of their experiences are difficult to read, including an incident involving Tony, Jacob’s best friend from his village, who is forced to kill an injured boy or face mutilation. Still, what went on in this part of this world in the early 2000s is an important global issue for people of all ages to be aware of, and these boys prove to be a good entry point into a difficult subject. Although War Brothers, adapted from the author’s prose novel Puffin, 2008), is fiction, it is based on interviews with survivors; “everything that happened in this book has happening, and is happening still.” With his first graphic novel, Lafrance’s watercolor artwork truly shines, depicting many close-ups that convey the deep emotions that the characters are going through, whether it be the naïve innocence of Jacob, the confliction of Tony, or the psychotic aggression of their LRA kidnappers. A truly important work that is well worth the read. ... a powerful graphic novel and a really good read. War Brothers is a riveting and compelling account of a young boy from northern Uganda who is abducted into the Lord’s Resistance Army. Sharon McKay and Daniel Lafrance have created a powerful graphic novel that provides a true no-holds-barred account of life as a child soldier. Readers are swept into the world of these child soldiers through intense action and dialogue where they experience their pain and losses, but also their triumphs and their courage. War Brothers presents this gripping tale in an engaging and attractive way for younger readers and fuels the elimination of the weapons system of recruiting children into war. — Melanie Tomsons, Executive Director and CCO of Never Again International: Canada, a not-for-profit organization that works with youth on genocide prevention, the elimination of the proliferation of child soldiers and building human rights through education.